Some losses are mourned with crocodile tears. 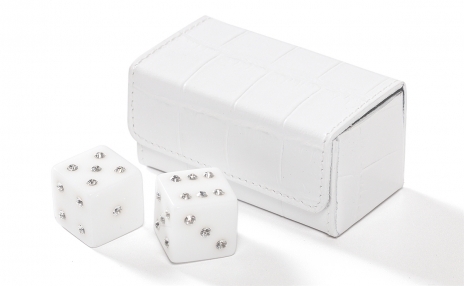 Such will be the case for your opponents with this outrageously luxurious pair of shimmering, Swarovski-studded dice, paired with a butter-soft white crocodile skin carrying case, engineered to elicit the envy of every opponent. Each pip sparkles with tiny crystals cut by the legendary Swarovski company, and these balanced game accessories are truly appropriate for those special moments of competition when you need a little something extra. Sense of careless elegance not included.